The first thing that any initial investigation into the soldier's load established is that, historically and in the modern era, the dismounted soldier is overloaded. After that come the realizations that economies in one part of the load are swiftly occupied by new items, with a resulting capability advantage but no ability bonus. Changing the soldier's load is about command decisions and risk management. Increases to personal protective gear in the modern era can be a significant part of the modern combat soldier's load, with the result that it becomes even more difficult to find those parts that can be reduced with acceptable risk. 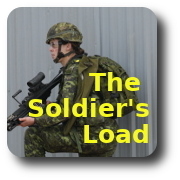 The following articles are offered as historic examples of the soldier's load dilemma. What soldiers carry, both on the march and in combat, affect their efficiency, and their ability to fight and win. Improved technology and supporting combat systems contribute greatly to the fight, but the last hundred metres will always be fought by the dismounted soldier on the ground, fighting with the arms they carry and the energy they have conserved to that point in the fight. Soldiers' loads, the physical demands they create, and the psychological factors that have impacts on limits of exertion all continue to compose a challenge for commanders to find an optimal solution. "I have invited N.C. officers and men to give me their ideas on the different articles of clothing and equipment now issued to them and also any improvements they would suggest after their experience of using the things during the present war; I therefore venture to forward our combined views on the subject with the object of inviting discussion and obtaining suggestions from a larger circle of all ranks—in the hope that we may see some of these "suggestions and into me" carried out in the coming Army Reform." "In war, matching is unquestionably the military operation of first importance, involving as it does the transference of troops to the point where the Commander decides to strike with maximum effect; in other words, while fighting is the luxury of the soldier, marching is his daily bread. But if the stroke is to be delivered effectively, the troops must still—after the march—be in condition to continue great physical exertion, and perhaps to repeat the march for an indefinite period." "The equipment of the infantry soldier is one of those matters which are liable to be shelved, owing to the cheerful way in which he fights, however irksome or unnecessary his burden may be; grumble of course he does, but regards the matter as inevitable; but nevertheless the problem is one of considerable importance, and should be reconsidered in the light of the experience of the war." "For it is conspicuous that what the machine has failed to do right up to the present moment is decrease by a single pound the weight the individual has to carry in war. He is still as heavily burdened as the soldier of 1000 years BC." "Colonel S.L.A. Marshall's article in the October issue of the Infantry Journal strikes close to the heart of a subject which has been of extreme interest to me over a period of twenty-three years as an infantryman. I agree with the principles underlying his discussion almost completely. … However, I am convinced that he has not gone far enough, however, in his recommendations for reducing the load of the soldier." "There are numerous accounts of overloading of infantry in the last war, the details of which could be found in many books. It is not my intention to delve into the details of these. An average soldier assaulting the Normandy beaches had eighty two pounds on his back. Likewise his counterpart in the Eastern and Pacific theatres carried sixty four pounds." "During the period covered by this account the infantry soldier had to do two things—he had to march, carrying enough on his person to make him more or less independent of other modes of transport and he had to fight, using some form of shoulder firearm, for which he had to have on him enough ammunition for immediate needs." "The problem with overloaded soldiers in combat is a recognized deficiency throughout the Army, but the solution to the problem is less recognized and even less understood. All commanders must therefore develop an appreciation for the problem and then resolve to practice risk analysis instead of risk aversion when determining the load their soldiers will carry." "Modern commanders of light infantry units must think seriously about the question of how much equipment they can require their soldiers to carry without adversely affecting their ability to fight. The solution is not a simple one; it requires critical command judgments." "Regardless of technology, then, leaders tend to load their soldiers too heavily, primarily because current unit SOPs represent worst-case planning instead of educated-risk analysis." 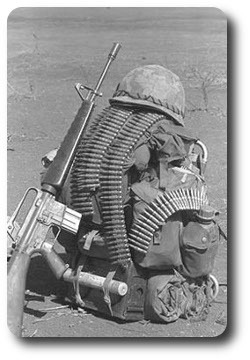 "It is readily apparent that light infantry soldiers today are being required to carry heavier loads than ever before. Data collected from soldiers in the field at the Joint Readiness Training Center (JRTC) at Fort Chaffee, Arkansas, for example, indicate that individual loads are averaging 88 pounds. In fact, it is not uncommon for some of these soldiers to carry more than 140 pounds." "While current technology permits soldiers to transport larger burdens on the battlefield, two road marching realities remain unchanged: First, carrying a heavy load is physically and mentally exhausting; and second, it often results in injuries that can limit a soldier's ability to perform his mission. Commanders must be aware of these facts and take steps to reduce their negative effects as much as possible."